As a child Julie was surrounded by fairy stories in rural Ireland. 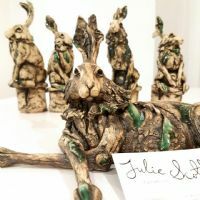 In combining Victoriana objects with natural narratives, Julie transports the viewer into microscopic, magical worlds. 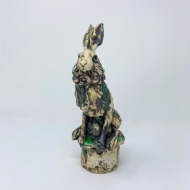 She depicts Irish Wildlife that she observes in the sand dunes and bog lands of rural Donegal. Clay is textured with vintage laces and finished with oxides, glazes, crackled glass and Gold Lustre. Julie also lectures part time at The Belfast School of Art.